Most often people talk about narcissism as negative phenomenon. I was browsing Internet for a while before starting to write this and you can find a huge amount of information. The basic guideline is to avoid people who are diagnosed with a narcissistic personality disorder but at the same time you can find an expression “healthy narcissism”. Please find out more yourself if you are interested. Narcissistic characteristics are egocentricity, self-love, seeking for attention, believing in one’s own importance, and needed to be admired. The dangerous part is when the person can’t care about anyone else in emphatic way and begins to abuse other people in order to get power for example. So why am I talking about this and what do I mean by a “closet-narcissism”? This term just popped in my head on Thursday when we were having our concert in Kokkola. The first time I thought of it when I was preparing for my last clarinet exam in Tampere. The thought was that when we perform we need to shine on the stage. We have to believe that we are awesome. We have to enjoy the people staring at us. Of course we also have to play well and practice that but at some point we should be able to trust ourselves so much that we know we can do it. We have to know that we are doing the best thing at that moment. So I had an image of a narcissistic part of the person coming out of the closet and going on the stage to shine and after that going back to closet and becoming the “normal” person. By all means I don’t mean that anyone should think that they are above other people. In a healthy way a person would respect him- or herself and other people at the same time. Should we then shine all the time even off-stage? In some ways probably yes, but at least for me it’s different kind of presence on the stage and in life general. And it all comes to the question: Why do people play the music or sing? Everyone has their own answers, hopefully. The way I see it, is that music enriches our lives and it is a way to express oneself. By performing we want to give and share the joy (or sadness or beauty or whatever) of the music for other people. I don’t play so much anymore just for myself. I want to play with other people or to someone who is listening. It motivates me to practice if I know there is something coming. These first two weeks of May have been kind of extreme for me. I have traveled in the train on seven days, made one audition, four of my students had exams, I had two performance in the theater and these two solo concerts that we organized with my dear friend Mirva Helske. I almost got sick and have never experienced it disappearing just like that. The days became long but still despite all the hassle I found myself extremely happy. In the theater I thought while playing “I just love to do this!” Also when we practiced with Mirva we were talking about how great this music is that we were playing. And just before entering the stage in Kokkola I was just babbling about my lovely dress and hair and the hall. And on the stage I felt truly awesome that all those people came to listen to us both in Kokkola and in Oulu and I wish they have really got something good in their lives. This entry was posted in musician's lifestyle on May 17, 2015 by helipauliina. A quick post from a train to Turku. Today is the audition in the Navy Band. But I also wanted to share our poster. The concerts are going to be next week! I’m thrilled. Wish to have great atmosphere. 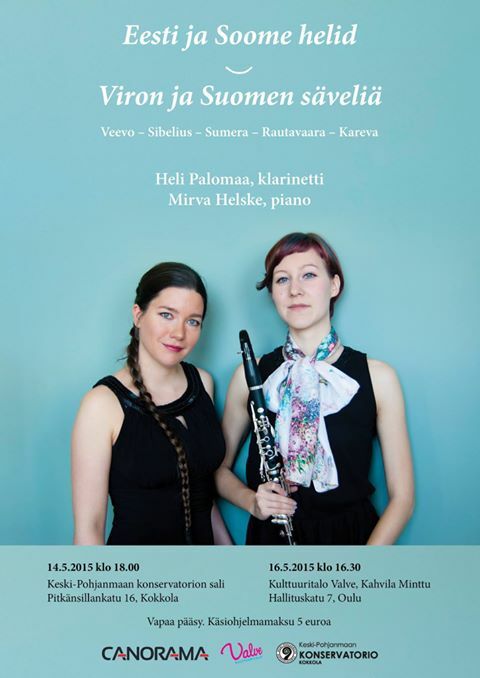 I am happy to bring Estonian clarinet music to Finland. This entry was posted in Concerts, musician's lifestyle, Performance on May 5, 2015 by helipauliina.